The previous-generation Chevy Impala carries over as the Impala Limited for 2014 and possibly longer--it's strictly for rental-car fleets. It took a while to get here, but the 2014 Chevy Impala fast-forwards over the past with fine handling and even better styling. The new Chevrolet Impala was worth the wait. For more than a decade, GM let the hallowed nameplate lapse, leaving it attached to a car that was no more than a fleet special even when it was new. For 2014, the Impala does a massive about-face. It's one of the best-looking sedans GM builds now, has excellent handling and interior room, and makes a convincing case to be Chevy's flagship--even with the rear-wheel-drive SS in the mix. It's so different from the previous sedan that the new Impala might be advised to retain counsel and sever all family ties with its namesakes. The outdated last-generation Impala is still available for fleets--but the new 2014 Impala you'll find in showrooms is sleek, a strong performer in V-6 trim, and commodious even for big adults. It's a sea change in style, in feature and safety content, and most convincingly, in the way it nails the balance of comfort and handling without getting too lazy or harsh. Now made from the same gear as the Buick LaCrosse, and built alongside the Chevy Volt in Hamtramck, Michigan, the 2014 Impala wears some crisply themed sheetmetal that we'd like to see more of on the smaller, less fortunate Malibu. The Impala's cues and details hit the high points the Malibu misses, without the misguided Camaro references in back and with assertiveness all over its front end. There's some CLS in its rear quarters, where the design really gels, even if it's fairly close to the same passages on the LaCrosse. The cabin? Give it some chamomile. The concept is high--like the Maxima, the Impala shaves away unneeded dash below a beltline--but the chorus of lines and textures and materials needs a more muted approach, or at least fewer cutlines. 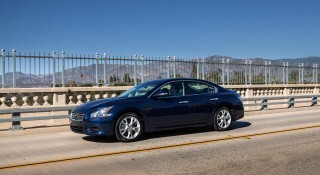 We've driven only the Impala with the 2.5-liter four-cylinder engine and the more powerful version with the V-6. Base versions will carry a 2.5-liter four rated at 196 horsepower. The Impala Eco version, with GM's eAssist mild-hybrid technology fitted to a 182-hp, 2.4-liter gas four-cylinder, uses battery power to add torque to the engine for a combined EPA rating of 29 mpg. The base four moves the car along smartly enough under most circumstances, and will even spin the inside front wheel accelerating out of curves. But under the hardest acceleration--a short uphill freeway on-ramp, for example--there's just not quite the reserve of power you'd expect in a car this big. It's the V-6 that lets the Impala justify its animal name. It's GM's latest 3.6-liter V-6, rated at 305 horsepower, coupled to a six-speed automatic with an aggressive torque converter that judders on occasion while it tries to conserve fuel. That's a mild distraction from the V-6 Impala's strong acceleration--0-60 mph in about 6.8 seconds--and from its thoughtfully composed handling. The ride's damped extremely well, even on the biggest 20-inch wheels and tires, and the Impala's electric steering never feels overly heavy or slow to react. As a large sedan by the Feds' yardsticks, the Impala offers up more space than the best-selling four-doors, and it tops the Azera and Avalon for usable space, too. On paper it reads smaller than the Taurus in some ways, but the net volume inside is larger. The front seats are very supportive in either leather or mixed media, and space is vast through the back seat, except in headroom. We expected a little more, to be honest, and we should have it, given the flatness of the back bench. The trunk almost makes up for it, and almost matches the Taurus cubic foot for cubic foot. The old-school Impala lagged in safety gear and crash-test scores, but the 2014 model has ten airbags and can be fitted with adaptive cruise control, blind-spot monitors, and parking sensors. A rearview camera is still an option on all but the LTZ, though. It's already earned a top five-star overall rating from the federal government, including five-star ratings in frontal and side impact. Along with the safety technology, the Impala's infotainment systems get a thorough upgrade. Bluetooth audio streaming is now offered, as is navigation. Chevy's MyLink system controls the secondary features via an eight-inch touchscreen LCD--features like space for 60 favorites (radio stations, destinations, whatever) and a thousand personal contacts, connections for up to 10 Bluetooth devices, and a swipey interface that lets you choose where the icons rest, or which of four graphic skins you want it to wear. The Impala arrives in showrooms in LS, LT and LTZ trims. Prices range from $27,535 for the base model all the way to $41,000 if you're not careful--but a well-equipped V-6-powered Impala LT with a rearview camera and MyLink audio will run about $31,700. The Impala's creased looks sets a new tone for Chevy, but the cockpit gets a little busy. It can be dangerous to tread on an icon, but after a decade or so of dull, duller, and dullest Impalas, Chevy had every reason to chuck the past and to stamp some new ideas into being. It works--beautifully. The new large Chevy sedan has a passing resemblance to the Malibu and Traverse at the front, but even there, the Impala gets it right where elsewhere it's gone a bit wrong. The shovel-shaped grille could wear a Honda logo. The headlamps may as well be etched with Saab logos. The hood has almost as many ribs as the old Chrysler Sebring, but comes off clean. The catapult for the shape comes at the rear door, where a complex, Mercedes CLS-like intersection of surfaces echoes the rear quarters on the Buick LaCrosse, until it darts off at the shoulder line into a new and smartly pressed crease. It's one of GM's best efforts at mingling looks while keeping the brands distinct. Meanwhile, when last we left Chevy's hyperactive interior design squad, they'd rendered the Malibu sedan in about a dozen textures and eroded inlets into the dash cowl, giving it a Nicholson-esque shoreline hairline. At some level, the ebb and flow works--your eyes move constantly around the cabin's perimeter. They're actually looking for a place to rest, before they get tired and give up. There's nowhere near as much glitz as in the Avalon, still, but the Impala makes up for it in its sheer number of finishes and cutlines. The controls work fine, especially the big gauges and their nested LCD screen (it's an option), or the sealed switches on the steering wheel that run cruise control and media. We just believe, in our heart of hearts, there's a way to pull off this dramatic a look with less drama. Brisk acceleration, quick steering and a near-perfect ride give the Impala a way to forget its past. Not too long ago, the full-size sedan was still an unflattering imitation of the land yachts of the Seventies. Even if it hailed from South Korea or Japan (via Kentucky), the average dreadnought put plush ahead of perky, bobbing and floating in the most matronly, smothering way possible. 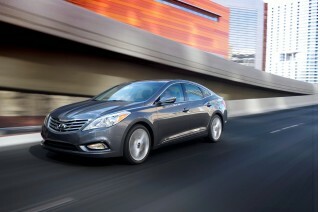 Now, the Azera's found its light, the Taurus is back as an SHO, and even Toyota's Avalon has a sport steering mode. Count the 2014 Impala in with the converts. It's latched on to the trend, emerging with the best front-drive dynamics of the lot. We've only driven two of the three available engines--the base four-cylinder and the optional six-cylinder--but there's a third engine available as well, with a mild-hybrid system incorporated. Base versions of the 2014 Impala carry a 196-horsepower 2.5-liter four teamed with a six-speed automatic transmission, sending power to the front wheels. That setup is rated at 25 mpg combined (21 mpg city, 31 mpg highway). The base 2.5-liter four performs well enough under most driving conditions. When accelerating out of corners during some damp and intermittently rainy weather on our road test, proved surprisingly eager to spin its inside front wheel. Four-cylinder Impalas use active noise cancellation that sends sound waves through the speakers to cancel out engine noises that customers find disturbing. This lets Chevy program the engine to run as slow as 1,150 rpm with a locked torque converter—a behavior that used to be called “lugging”—without occupants hearing noises that might make them think something was wrong with the car. Only in situations where swift acceleration was suddenly needed—from, say, 30 to 60 mph--did we find the four-cylinder Impala lacking in power. It felt as if the car should have shifted down to an even lower gear for better acceleration, but had a gear missing. The engine revved nicely as high as 6500 rpm, but the car simply didn’t gather speed as swiftly as we would have liked. 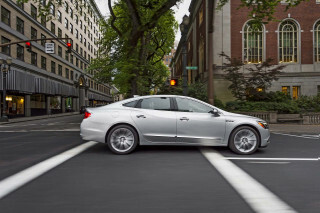 For even better fuel economy, the Impala Eco model uses a 2.4-liter four fitted with GM's eAssist mild-hybrid system. It can't move the car on electricity alone, but recaptures otherwise wasted energy to charge up a small lithium-ion battery in the trunk--and uses it to provide additional torque to the engine when needed, reducing downshifts to keep the engine operating at its more economical low speeds. It's rated at a remarkable 29 mpg combined (25 mpg city, 35 mpg highway). 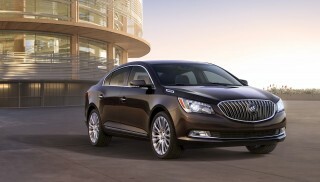 We haven't been in an Impala Eco, but the same powertrain in its platform mate, the Buick Lacrosse, works best when driven relatively gently. While you can feel the motor clutching in and out under some circumstances, it's relatively well muffled. Driven more aggressively, the transitions become more obvious. For smooth, strong power with a 0-60 mph time in about 6.8 seconds, plus a nice raspy exhaust note as a bonus, you'll turn to GM's latest 3.6-liter V-6. The carryover powertrain is rated in the Impala LT and LTZ at 305 horsepower, with a big flat torque band and throttle response that avoids the overzealous, hair-trigger responses of some of its brethren. It's as energetic as any Impala we've driven over the past decade--and it's likely to stay on top of the Impala hierarchy, the arrival of the rear-drive Chevy SS sedan makes an Impala SS less likely. The six-cylinder Impala is slightly lower in fuel economy than the best full-size sedans. 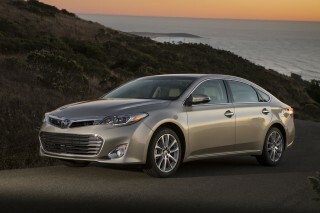 At 21 mpg combined (18 mpg city, 28 mpg highway), it's 2 to 3 mpg lower than the Avalon and Azera. 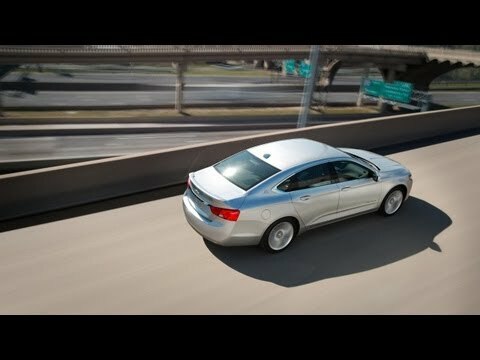 On the other end of the scale, the Impala Eco's 29 mpg combined is far below the Avalon Hybrid's commendable 40-mpg rating. All Impalas get a six-speed automatic transmission with a manual-shift mode activated by a click switch on the shift lever--where no one will use it, since the tall console makes it an awkward motion. It's also not a "sport" mode, in that the timing of the shift doesn't change. The transmission isn't as seamless as the GM benchmarks of the past. Because the torque converter's set up to lock up more often in the name of fuel economy, a jumpy foot can trigger what feels like half-shifts as the converter unlocks. It's still ready to react quickly to the right amount of pedal. The Impala's built from the same body structure and suspension design as the Buick LaCrosse, and it shows. The premium setup lays out front struts and a multi-link rear end with digressive damping that's stiffer against small bumps, more relaxed against larger ones, with body lean put on a leash through rebound springs. The body's stiffer, from passenger cell to shock towers, to neutralize unwanted shimmy. What that means is an Impala completely unlike the one just before it. The control over ride motions is subtle and exceptional given where it's come from, whether you're on the stock 18-inch wheels and tires or the optional, more noisy 20-inchers shod with Bridgestone Potenzas. Belt-driven electric steering complements the ride with accurate tracking and without gratuitous, artificial weight. The Impala has balance and all-around composure that the Taurus, Avalon and Azera miss by a factor here and there. It's comfortable, without lapsing into lazy. The front buckets are swell and leg room abounds, but rear-seat headroom is tighter than we expected in the Impala. In polite circles, the Impala would be called beefy. The Feds call it a full-size sedan. In truth, it's not a lot bigger than an Azera, a Passat, or an Avalon--but it packs a lot of room under its roofline, shaming the inefficient layout of the Ford Taurus, for one. The Impala's overall length of 201.3 inches draws down to 111.7 inches between the wheels--compared to 106.3 inchess of wheelbase on, say, a three-row Kia Sorento crossover. It's 73 inches wide, too. Compared to the last Impala--now the fleet-only Limited--the 2014 version has about 3.5 inches more front-seat leg room and 2.2 inches more in the back seat. Open the wide, tall doors, and the Impala V-6's nicely shaped seats aren't too deep a knee-bend away. At least five different seats are specified across the lineup, but that's mostly because of optional seat heating and ventilation--only the base versions are cloth. Leather-clad versions on the LTZ have a middle grade of hides covering them, better than the cloth/vinyl seats in look and just slightly, in feel, since lumbar adjustment comes with them standard. Head and leg room are more than enough for even 99th-percentile types; the Impala's one of the rare new cars where you can power the driver seat too low and too high. The rear seats aren't quite as close to premium, but leg room is only an inch or two short of limousine status. The cushion lays almost flat, it's a bit short for the car's size--and even so, headroom isn't extraordinary. I made close contact with the headliner, and at six feet tall, I'm not the worst-case scenario for backseat use. Two adults will have enough space for a pre-teen between, though, and the seats can be fitted with bite-sized head rests shaped like old-school car bumpers. Score one for visibility. Even with five passengers, filling the Impala's cargo bins will take some work. The trunk's 18.8 cubic feet, second only to the Taurus' 20-cubic-foot whopper. It's a little shallow, but the trunk floor is flat and extends deeply beneath the rear glass. The doors all have long bins with bottle holders; the center console can swallow a shoebox, a smartphone in either a rubberized tray or a bin hidden under a lid, and two drinks. If you're in an LT or an LTZ, there's a hidden chamber behind the MyLink LCD touchscreen, too--tap a button and the screen rises so you can stow goodies, then lock it out in a valet mode with a code you can enter and change. Chevy has tuned the Impala's interior for quieter rolling ambience. Four-cylinder models will sport active noise cancellation, like Chevy's Equinox, and the plusher versions get thicker glass and more sound deadening. The impression of noise control is a good one. It's in the area of fit and finish where the Impala can get a better sense of direction when it comes in for the inevitable mid-cycle refresh. The busy twin-cowl cockpit is covered, studded, paneled, and draped in so many different materials and textures, it's almost a parlor game to find and name them all. The seat-heater surround is a glitzy, flecked black plastic; the door caps are soft to the touch but openly grained. Consistent, not insistent--that's is all that's keeping the Impala from fully connecting with the elusive quality genome. We wish a rearview camera were available for less; but there are loads of safety-tech extras on offer, and crash-test ratings are top-notch so far. While other big sedans have marched ahead in safety scores and equipment, the Impala had lagged. That changes with the 2014 model, which adopts a whole range of new technology for active and passive protection. Beyond the basics, the Impala's been brought up to speed with a suite of standard or available features like blind-spot monitors; lane-departure warning system; adaptive cruise control; a rearview camera and rear parking sensors; and a forward-collision warning system. The Impala is also the first Chevrolet model to get full-speed-range adaptive cruise control, as well as a radar-based Crash Imminent Braking feature that will help intervene and apply the brakes to help avoid a crash or lessen its severity. If there's a quibble with the Impala's safety package, it comes down to two features we think are essential on family cars, given the competition and given how most drivers can use help in driving more safely. Bluetooth is standard on the V-6 car, but not on the base LS; likewise, a rearview camera's an option on the Impala LT, and only standard once you've moved up to the LTZ. Visibility's fine, but side-view and surround cameras are becoming the norm on cars like the less expensive Honda Accord. Infotainment gets brightly colored in Chevy's MyLink system--plus there's a secret chamber behind its slide-up screen. The 2014 Chevy Impala splits itself into three trim levels--LS, LT, and LTZ. On the V-6 models, only the LT and LTZ trims are available. Every Impala comes with power windows, locks, and mirrors; cruise control; air conditioning; and 18-inch wheels. Options are few on the $27,535 Impala LS: just rear parking sensors, a cargo net, and rear headrests. The $29,785 Impala LT adds a combination of cloth and vinyl upholstery; a fully powered driver seat and a passenger seat with power height (but manual fore-aft) adjustment; and an AM/FM/XM/CD player with hidden storage behind the LCD audio screen. Major options include 19-inch wheels; microfiber/vinyl seats; a power passenger seat; rear parking sensors and a rearview camera; pushbutton start; Bose audio with 11 speakers; remote start; a sunroof; and navigation. The LT and LTZ come standard with MyLink, Chevy's infotainment controller, essentially a version of the Cadillac CUE system without the haptic feedback. The touchscreen's brightly colored icons are gateways to a range of connectivity and streaming features that might be out of the Impala's demographic ballpark. Voice-to-text is one of the least-used capabilities, Chevy tells us--but there's a valet mode that locks the storage bin behind the touchscreen for safe phone storage, while it also locks out contact and navigation information from prying eyes parking your car. MyLink has more than 60 slots for favorites, so you can program one-touch access to anything from a radio station to a destination, and it can connect to up to 10 different devices via Bluetooth while streaming audio. At the top of the Impala range, the $34,555 LTZ brings with it standard 19-inch wheels; leather seats; a power passenger seat; ambient lighting; parking sensors and a rearview camera; pushbutton start; a sunroof; and a bundle of safety features optional on the LT, including forward-collision warning, blind-spot monitors, and a lane-departure warning system. 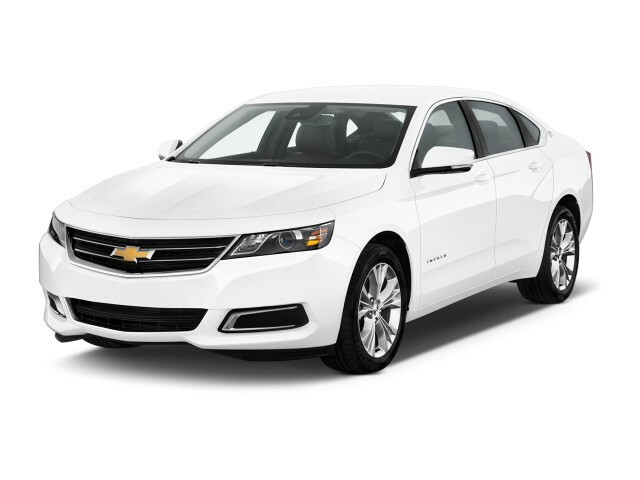 With all the options--power tilt/telescoping steering; navigation; 20-inch wheels; Bose audio; adaptive cruise control; and ventilated seats--an Impala LTZ can cost more than $41,000, though Chevy expects a $32,000 LT with the V-6 engine to be its most popular model. 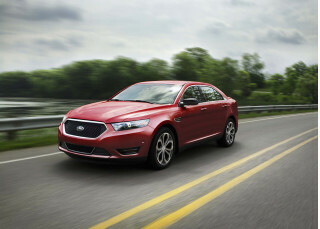 Other full-size sedans earn better EPA figures than the new Impala. Gas mileage won't be the first reason the Impala ends up on anyone's shopping list, and the V-6 versions are set to earn EPA ratings a few miles per gallon lower than some other big four-doors. The EPA has published the Impala's gas-mileage ratings, with the base vehicle coming in at 25 mpg (21 mpg city, 31 mpg highway) and the more powerful V-6 at 21 mpg combined (18 mpg city, 28 mpg highway). 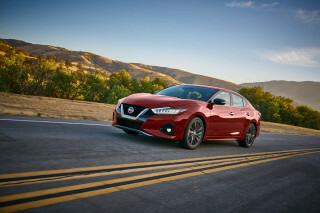 The combined 21-mpg rating for the V-6 falls below the Toyota Avalon's 25 mpg, the V-6 Taurus' 23 mpg combined, and the 23-mpg figure posted by the Hyundai Azera and the Dodge Charger with its new eight-speed automatic. In our first-drive test loop set up by Chevy, the V-6 Impala's indicated economy checked in at 20.3 mpg, tallied after lots of canyon runs and a few stretches of 75-mph interstate. Four-cylinder versions brighten the picture. We logged 25.1 mpg--right on the nose--for the base 2.5-liter four-cylinder Impala, albeit over a short 20-minute drive covering about 12 miles. At the top of the fuel-economy list is the Impala Eco, fitted with GM's mild-hybrid eAssist system. The addition of special aero add-ons--dams, spats, and active grille shutters that smooth the nose for better efficiency--lets the Impala Eco equal the 29-mpg combined figure of the Buick Lacrosse that uses the same system. That's better than the 26 mpg of the turbocharged EcoBoost Ford Taurus--but well off the 40-mpg mark set by the Toyota Avalon Hybrid. Excellent with good looks and very good fit and finish..